Where did Jason go? Bonus: A healthy Caribbean recipe! So, where do we start. I had let Off the Broiler go into indefinite hiatus about two years ago when I moved from New Jersey to South Florida. I discovered that along with my full time job and my writing for the technology industry, I didn’t really have the time for food blogging anymore. To a large extent I now consider food blogging a pastime for the younger generation. I decided that I was not going to re-establish myself as a foodie blogger down here in South Florida because there were already a good number of people doing it, who know the area far better than I do, and who have far more connections in the food and restaurant industry down here than I could ever hope to amass. I spent 20 years doing that in the NY/NJ area and I just didn’t have it in me to do it all over again. Food blogger relevancy is overrated and it reaps few rewards for what amounts to a lot of work. In 2014 my co-founder at The eGullet Society for Culinary Arts & Letters, Steven A. Shaw, died suddenly at the age of 45. It was a horrible, tragic thing, and made me consider very seriously the issue of my own mortality. At about the time Steven died I was facing the real possibility that I too would probably die within the next five years, due to my own unique health complications. I was morbidly obese (390 lbs or so), I had Type-II diabetes, I had hypertension, high cholesterol and obstructive sleep apnea. I was taking a fist full of medications every day to try to keep things under control. Bottom line, I was a mess. Years ago, I had tried various methods of weight loss, including going on a healthier diet (there’s a large amount of healthier lifestyle posts in the archives) but the bottom line was that fighting a lifetime of obesity was a losing battle. The New York Times chronicled one of my first attempts at trying to get my weight under control, but this was not a workable long-term solution. I was always hungry because my stomach was so enlarged, so I ate huge portions of food. I also fought constantly trying to eat the right things, but never could keep it up. As a food blogger there were too many distractions. If I didn’t do something drastic I would probably not live to see 50 years old. I had my 46th birthday in 2015. After a lengthy 6-month approval process, on January 15th, 2015, I had a surgical procedure called a Vertical Sleeve Gastrectomy. My surgeon, Dr. Paul Wizman, is one of the best in South Florida and I recommend him highly to anyone looking at bariatric procedures down here. 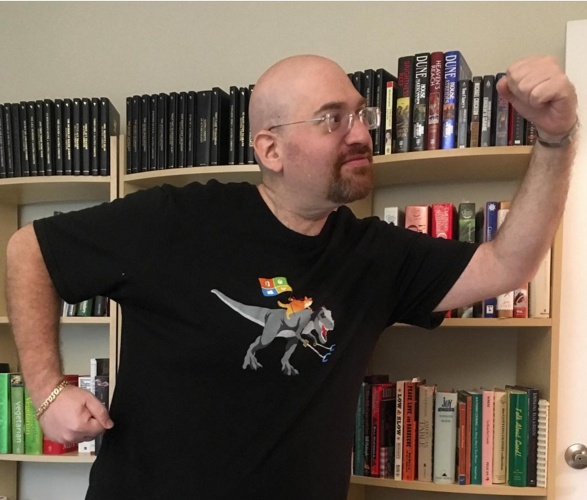 As of January 2016 I have lost over 125 pounds. My diet consists heavily of protein and some vegetables, with little or no carbohydrates or processed foods of any kind. I have to take dietary supplements for the rest of my life, but it beats the meds. My portion sizes, shall we say, are a lot smaller than they used to be. I no longer register on the A1C as a diabetic and I no longer take diabetic medications or have obstructive sleep apnea. 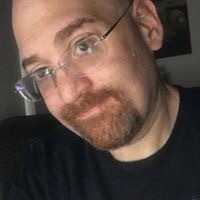 As of this writing I weigh under 240 lbs, and I hope to get down to about 200 over the course of the next year. For those who are wondering, my wife, Rachel, had the same procedure done and she is doing very well. Bottom line: I’m in a much better place than I was a year ago. I’m continuing to lose weight, but to do that as a bariatric patient and to keep the weight off, you have to “stay with the program” and continue to make the proper food choices as well as stay active. Staying with the program, much like dealing with any kind of addiction, requires fixing your brain and learning new habits. The surgery helps immensely, but it’s only a tool, and it has to be used properly. As part of this process I’ve given a lot of thought to other people who are struggling with weight loss and obesity. In South Florida and all around the Caribbean obesity and diabetes among Latin Americans is a serious problem because the diet is heavily based on carbohydrates and the use of saturated fats. Caribbean food is incredibly tasty and South Florida is one of the best places in the country to experience it. But if you eat fried food, rice, beans and plantains every day, it’s a bad combination. 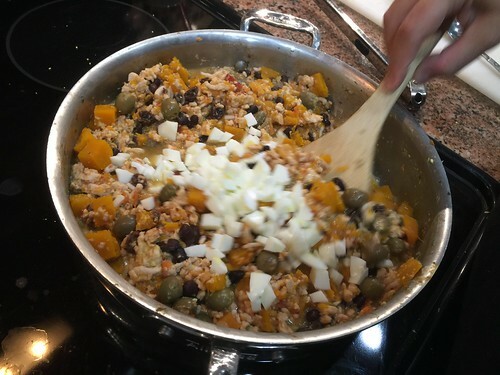 The first Caribbean recipe Rachel and I wanted to try to see if we could make healthy is a Picadillo, which is a dish served in virtually all Latin American countries, but it is particularly popular in Cuba, Puerto Rico and the Dominican Republic. It’s also one of my favorites. Traditionally it is made with seasoned ground beef, tomatoes and has potatoes in it, but it has a lot of variations depending on what country it is made in and whose family recipe it is. Typically it is served over white or yellow rice along with fried plantains, or used as an empanada filling. Dominican versions have a sweet and sour element to them due to the addition of sour orange and raisins. I thought that sounded interesting, so I figured I’d try to incorporate that. 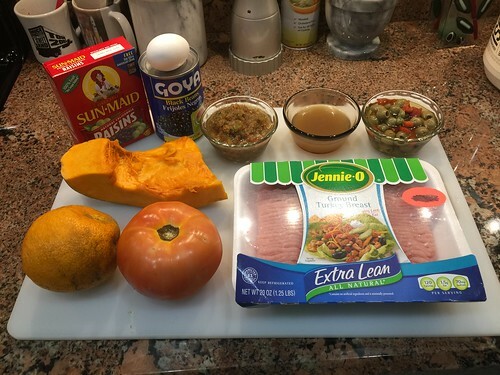 This version of Picadillo that Rachel formulated (along with my input) is made with ground turkey breast (pavo), which is extremely low in fat compared to the carne molida that is normally used (70 or 80 percent lean hamburger, etc). Instead of the potatoes, we’ve added calabaza, a type of Caribbean pumpkin, but you could use any kind of pumpkin you want. We’ve also added black beans to this to give it a little bit of complex carbohydrates and that extra Caribbean something. Picadillo heresy? Maybe. But try it anyway. Heat a large skillet over medium-high heat and add chopped Tomato. 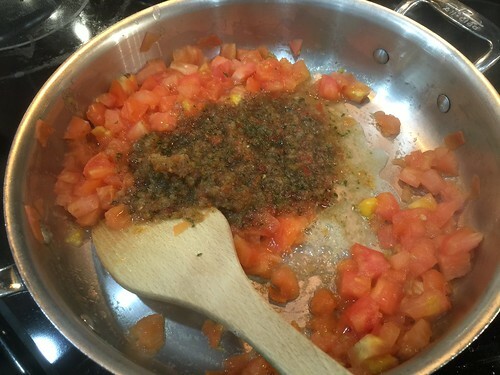 Once the liquid starts to cook out (about 5 minutes) add the Sofrito and again, cook for about 5 more minutes until the liquid starts to evaporate. 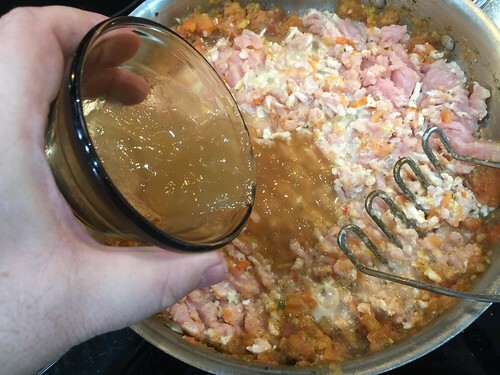 Add the ground Turkey Breast and mix and chop it into the vegetables until it is mostly white and well crumbled. Add the Stock, cubed Calabaza, Alcaparrado, and Raisins. Stir to combine, reduce heat to very low, cover and braise for 15 minutes. Meanwhile, separate the egg whites and yolks, grating the yolk and dicing the whites, set aside. Juice the Sour Orange. 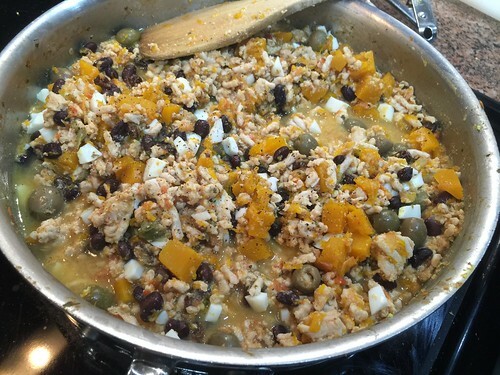 When 15 minutes are up, gently fold in the Black Beans, Sour Orange Juice, diced Egg White, and grated Egg Yolk. Taste for seasonings, add a couple of spoonfuls of the Alcaparrado juice instead of adding salt, and add some fresh ground pepper. If you wanted, you could serve this over brown rice or a high protein grain like quinoa, or just by itself. And yeah, you could stuff it into an empanada too. This entry was posted on Sunday, January 17th, 2016 at 3:00 pm and is filed under Florida, Food, Healthy Eating. You can follow any responses to this entry through the RSS 2.0 feed. You can leave a response, or trackback from your own site. 5 Responses to Where did Jason go? Bonus: A healthy Caribbean recipe! This recipe sounds wonderful Jason. Thanks!! And congrats to you for what must be a difficult transition to a new lifestyle. I applaud and admire you! I was type 2 diabetic also and my A1c was so bad, I was using an insulin pump. I had the VSG in Nov 2013 and lost 70lbs. I added back a small amount of carbs, but mostly whole wheat and no white stuff. I still get really full really fast( its amazing to me) and food just does not hold the same appeal as it once did because a restaurant meal can now last me 3x. I remember the first time I went to Vegas and didn’t do a buffett( The Bachanal) was my favorite. The hunger hormone has come back and I do snack( whereas I did not snack in the first year probably). Now its very much a struggle with emotional eating. Or, I’ll want to eat more because the food looks so good and I just want it. The underlying issues that made me overeat in the first place are still there and I still have to tell myself ” Stop, you’re full” almost every day. Good Luck.